The next generation Intel X99 platform together with the Intel Haswell-E processors is just around the corner. In a leaked roadmap posted by VR Zone, three Haswell-E processors will be released sometime in Q3 or Third Quarter of 2014. The Haswell-E processors include the Intel Core i7-5960X which is the Extreme edition CPU, followed by the Intel Core i7-5930K and Core i7-5820K. Check out more details below. UPDATE: Latest reports says that the new Intel Haswell-E processors and X99 motherboards will be launched this coming August 29, 2014. 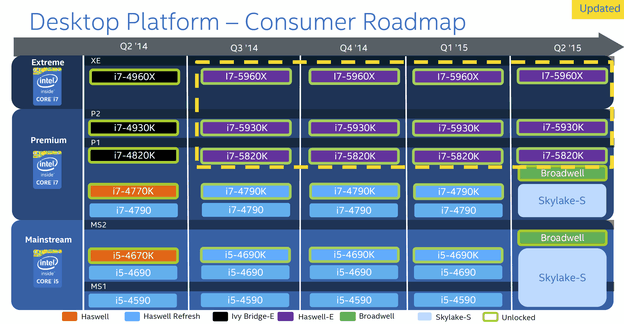 As you can see from the updated consumer roadmap above, the upcoming Intel Core Haswell-E processors for the X99 platforms will be released this coming Q3 2014 already. There is no exact date or month yet, but I’m guessing that it will be launched sometime in September or October, and will most probably be launched together with the new X99 motherboards. We have seen several X99 prototype motherboards already from MSI, EVGA and others during Computex 2014. This means it won’t be long now until the CPU that will be powering them will be revealed to us as well. In fact, motherboard manufacturers might already have prototype or engineering samples of the said Haswell-E processors. Otherwise how else would they be able to manufacture and test their X99 motherboards? The Intel Core i7-5960X will be King of this series, packed with 8 Cores and supports Hyper Threading technology. It will have a base frequency of 3GHz. It is followed by the Intel Core i7-5930K with 6 Cores, 15MB Cache and a base frequency of 3.5GHz. And last is the Intel Core i7-5820K also with 6 Cores, 15MB cache, and a lower base frequency of 3.3GHz. All three Haswell-E processors will support DDR4 memory and will have a Thermal Design Power or TDP of 140W. You can see more details about their respective specifications here. The Intel Core i7 Haswell-E processors for socket LGA 2011-v3 X99 motherboard are now available. Below are their respective prices and where you can buy them. Also from the leaked roadmap, we see that the 5th Generation Intel Broadwell K series or unlocked processors will be released by Q2 of 2015. Broadwell Y series will be released as early as Q4 this year, and Non K on Q1 of 2015, which was earlier revealed here. There was also a leaked roadmap before showing the release dates of the Broadwell K and Skylake here.